While reading the various rimfire shooting forums around the internet, I have come to see a new “want” from owners of .17HM2 (.17 Mach II) rifles. They want to see the Mach II loaded with a game friendly bullet, such as the 20 grain game point that is currently loaded in the .17 HMR. 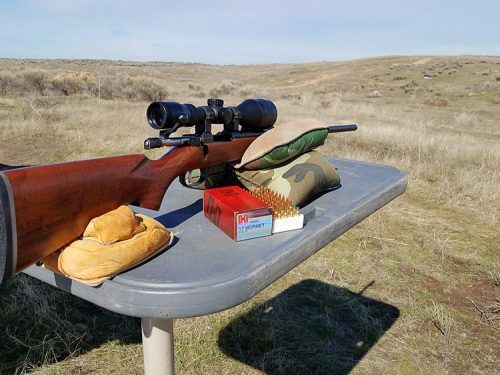 After shooting hundreds of ground squirrels with my Mach II, I can understand the need for a bullet that does not effectively destroy half the edible meat on a small game animal. I know what you’re thinking, the .17HM2 (.17 Mach II) is very accurate in the right rifle, so why don’t these hunters just make head-shots on their game? Well, shooting at paper and shooting at an animal that is hiding, moving and simply trying to stay off the BBQ, are two different things. The fact is, a game point in the .17HM2 (.17Mach II) is not an unsubstantiated request. The need is out there, but is likely to go unfilled. There are rumors that Fiocchi Ammunition is coming out with a 20 grain game point offering this fall, but so far my telephone calls to Carlo (Fiocchi America’s Media contact) have gone unanswered, so details are sketchy. 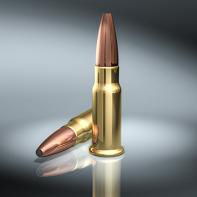 Also, word has it that Hornady may offer a full metal jacket version of their .17HM2 (.17 Mach II), however that too is not available yet and we have no target date for release. Other than those options, the likelihood of a 20 grain game point in the .17HM2 (.17 Mach II) seems to be a far-off prospect. Day one testing this round was spent shooting some of the larger ground squirrels we have here in the Southern California Mountains. As everyone should know by now, I have a small game lease with Tejon Ranch, located about 70 miles north of Los Angeles. 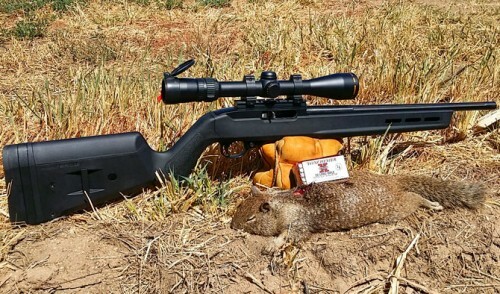 It is 270,000 acres of ground squirrel heaven, so I knew finding furry targets to shoot with the .17 Aguila/PMC would not be an issue. 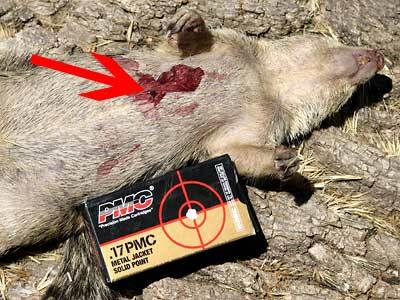 Closer inspection of the ground squirrel showed that the bullet hit right where I aimed, high on the shoulder. Unlike the Hornady V-Max bullets, it punched a hole clean through the squirrel and leave a welt-like wound on the exit side (see picture below). It killed the squirrel instantly, but did not leave the body a blown-up, bloody mess. For once, while hunting ground squirrels, this was a positive thing. I knew if I ever turned my sights to game animals, like cottontail rabbit, it would not destroy the edible meat like the V-Max does. 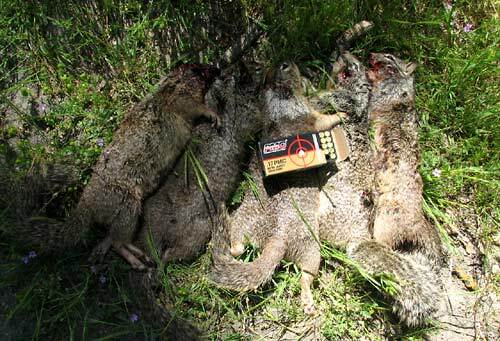 I shot a handful more ground squirrels with the Aguila/PMC round to confirm my findings, and the results were the same, dead squirrels with very little damage to the edible meat portions. Granted, some of my shots were head/neck hits, but most people who consistently shoot the .17HM2, know that even those types of shots will cause great damage, depending on the angle of hit. After spending some quality time with this round I believe it is not for everyone, but most small game shooters should give it a try. I know the feeling of cutting badly damaged meat off an animal hit with a highly explosive bullet. 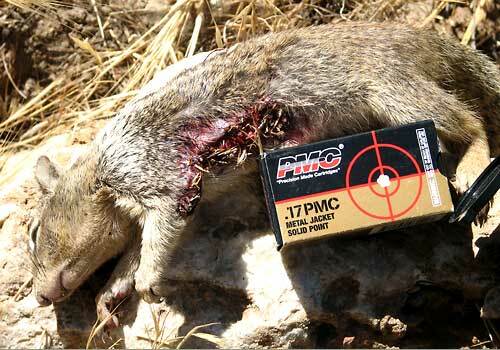 No one wants to waste game meat, but currently, bullets designed for exploding small varmints are the only option right now for the .17HM2. The .17 Aguila/PMC is a viable option when proper bullet placement in the shoulder area are the norm. 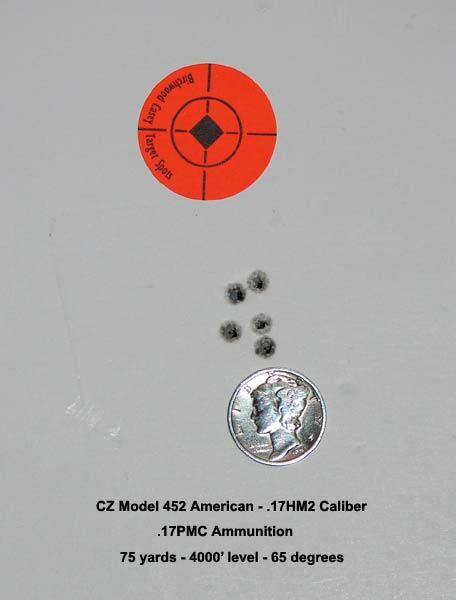 Ballistically closer to .22 Long Rifle, therefore effective distance is My CZ Model 452 American requires me to hand feed each round, making it a single shot. The Aguila/PMC round will not feed directly from the magazine. After about 20 rounds I was able to do this quite quickly and without taking my eyes off the animal I was shooting at. Did I mention good shot placement is vital in order not to lose game? Can I shoot the .17 Aguila/PMC in my bolt-action rifle that is chambered for the .17HM2 (.17 Mach II)? Can I shoot the .17HM2 (.17 Mach II) in a rifle chambered for the .17 Aguila/PMC? Where can I purchase .17 Aguila/PMC ammunition and barrels? 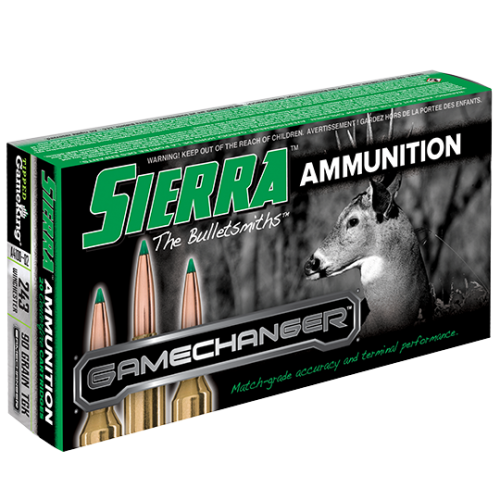 Natchez Shooting Supply carries the .17 Aguila version of this ammunition and at press time, it is on sale for $3.92 for a box of 50. I have been told that they carry quite a bit of it, so availability is not an issue at this time. Natchez also offers the Clerke International rifle barrel for the Ruger 10/22 for $89.95. However, from my experience, the description of the round’s capabilities (in that ad) is a bit over-stated. Centurion Arms, which is the United States distributor for Aguila Ammunition, offers direct to consumer purchases of the .17 Aguila version of this ammunition and at press time, it is $64.00 for a brick of 500 rounds. Midway USA is carrying the .17 PMC version of this ammunition. At press time it was $4.99 for a box of 50, or $90.99 for 1000 rounds. ER Shaw Custom Gun Barrels offers a .17 Aguila/PMC barrel for the Ruger 10/22 or 77/22 rifle which will allow you to shoot the Aguila/PMC round out of your Ruger with just a barrel swap. At press time the current wait was 12 weeks for one of these barrels. 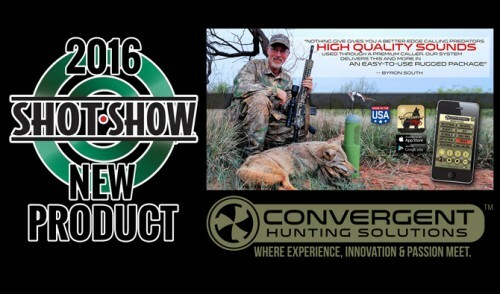 Cost ranges from $109.00 for a standard factory contour barrel up to $205.00 for a fluted, target, bull barrel. – These barrels are no longer available. Is the .17 Aguila/PMC ammunition going to be available forever? I don’t know the answer to this. 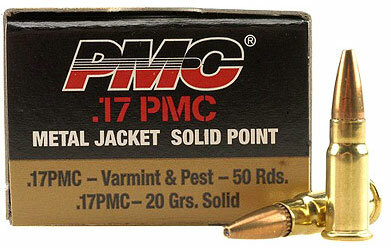 While the .17HM2 (.17 Mach II) seems to increase in popularity, the .17 Aguila/PMC never really caught on. Therefore, I think a large purchase, in order to save for a “rainy day”, is good advice. If Hornady or Fiocchi ever releases the 20 grain game point in the .17HM2 (.17 Mach II) caliber, I believe the Aguila/PMC round will become obsolete. Did you really kill all those ground squirrels and let that good meat go to waste? Ground squirrels are vermin. They carry many diseases, including the bubonic plague (aka: black death, black plague, etc). Cannibalistic, they will readily eat the guts of a freshly shot cohort, with complete disregard of the next bullet which probably has their name on it. So, if they are so eager to eat each other, they must taste REALLY GOOD!! Here is a website with lots of recipes. Just replace the tree squirrel called for in the directions, with ground squirrel! Oh, when you get out of the hospital, let me know how it tasted!